VISITORS heading to the North East to view the world famous Lindisfarne Gospels can enjoy a glimpse of medieval life at a castle with links to Saint Cuthbert. Thousands of people are heading to Durham to see the illuminated manuscripts which are the focal point of the Lindisfarne Gospels Durham Exhibition. 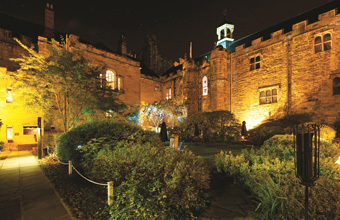 Now, they can re-trace the journey of the saint who inspired them, at Lumley Castle hotel at Chester-le-Street. The hotel, which has its origins in the ninth century, has been inundated with modern day pilgrims, keen to visit the exhibition and the town, which gave sanctuary to Saint Cuthbert's body. Lumley Castle's business development manager Samantha Buchanan-Robinson said: "When Lindisfarne was attacked by Viking invaders, the monks fled with his body and roamed the north of England for seven years before being offered sanctuary close to the castle. "Anyone with an interest in the Gospels or in medieval English life is sure to be fascinated by Lumley Castle and we're delighted to be welcoming guests from around the world."